Learn about a regatta in Venice, Italy, and challenge children to make the best boat. 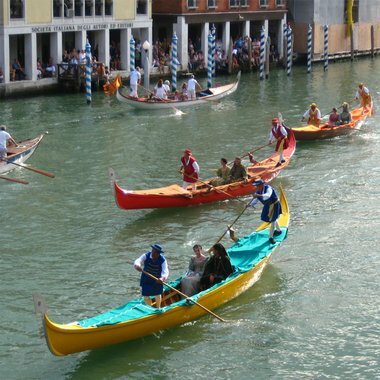 The Regata Storica (Historic Regatta) is the most famous regatta of more than 120 that take place in Venice between April and September each year. It is held to commemorate the welcoming of Caterina Cornaro, wife of the King of Cyprus, who in 1489, renounced her throne in favour of Venice. The start of the event sees a parade of boats decorated in traditional 16th century style, powered by crews dressed in period costume. The parade is headed by the Bucintoro, historically a galley for the doge (duke) and now an emblem for the city. There are also rowing races dating back to 1274, the main event being the men’s caorline (broad, snub-nosed lagoon vessel) contest – a very strenuous affair!